Many teenage boys have dreamed of owning a hot hatchback as their first car. A few have actually gone through the trouble of souping up their cars so they can drag race other cars from traffic light to traffic light. While this is a bit of reckless enjoyment that many men grow out of as they get older and more responsible, it doesn’t mean that the need for speed is only reserved for the young and stupid. Track days are the ideal way to experience the thrill of racing in a relatively safe environment. Motor racing tracks often have days where the public can race their cars around the circuit. 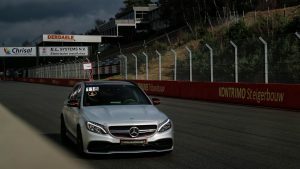 One of the most famous track days is the Touristenfahrten at the Nürburgring, where anyone can buy a pass to complete a lap around the infamous Nordschleife. There, one can find anything from an everyday runabout to a souped-up hobby car to a full-on racecar. The 13-mile circuit with its 73 turns requires an enormous amount of skill to set a good lap time, and many overeager amateur racers get it wrong, sending their cars crashing into the barriers as they lose control. There are safer ways to enjoy a track day, that won’t result in you crashing your own car. There are many companies that provide track day experiences with their own racecars. These can range from track-ready hatchbacks to GT3-spec sportscars, to F1-inspired single-seaters. These programmes usually start with a safety briefing and include some race coaching. You are also issued with a fireproof race suit and a helmet. While these programmes are not cheap, they are still within reach of normal people, and are the best way to experience what it’s like to be a racing driver, without having to invest in the enormous cost of owning your own racecar.